Pam Adams is a professional Celtic Harpist based in Cornwall. 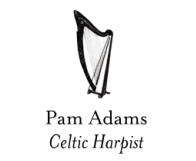 For an enriched wedding atmosphere, experienced celtic harpist Pam creates a stirring soundtrack to the guests’ and bride’s arrival, the signing of the register and the bride and groom’s exit. Her Salvi Electracoustic Egan provides an unrivaled acoustic ambiance and natural sound. Pam also plays the harp to create a lovely musical backdrop for many other occasions too, such as wedding receptions, birthday or anniversary parties, Christmas parties, dinner parties or garden parties as well as the more formal occasions such as Church Services, funerals and Christenings. With an extensive repertoire from Celtic to contemporary, classical to Christian, she can also arrange the music of your choice to ensure an individual and melodic event. Pam is based in Cornwall and covers the South West. Affordable rates. As featured in WED Cornwall magazine. Watch the video with Pam playing in the background here.